Summer is here, almost (except maybe here in Seattle). What better way to cool off than with a perfect glass of iced coffee? Iced coffee is not just a simple matter of plopping some ice cubes in your coffee cup. If you do that, you'll just end up with tasteless diluted coffee. Yuck! There are probably as many recipes for iced coffee as there are coffee traditions. Here are a few of our favorites. With a little effort you can create a great glass of satisfying iced coffee! For traditional iced coffee, how about a recipe for Perfect Iced Coffee? The obvious drawback to this recipe is the requirement to allow the coffee to steep for a minimum of eight hours. If it's hot and you're thirsty, who wants to wait eight hours? But if you can wait, this is a good basic recipe. Best to make before bed and let steep overnight so it's ready first thing in the morning! 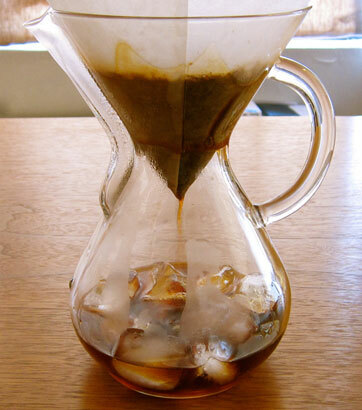 For quick and fresh iced coffee, nothing beats the Japanese Iced Coffee Method. Instead of keeping cold-brewed coffee sitting and oxidizing in your fridge, the Japanese Iced Coffee Method brews each cup fresh. A variation is the Steep and Strain Method, also known as New Orleans Iced Coffee. The secret to New Orleans Iced Coffee is a coffee concentrate made by steeping coffee grounds in cold water. Again, the drawback is the requirement to let the coffee concentrate steep overnight. If you're feeling adventuresome, try some iced coffee that is flavored and spicy. We like Thai Iced Coffee, which has cardamom infused into half and half. This may be a stronger iced coffee than many Americans are used to. But hey, life is short! We think that vanilla and coffee go together like Laurel and Hardy. For a great flavored iced coffee, here's a recipe for Vanilla Iced Coffee. So you've got a perfect glass of iced coffee. What could make it better? Well, there's homemade Coffee Ice Cream! So there you have it! Our suggestions for beating the heat this summer. Or just drinking damn fine iced coffee. 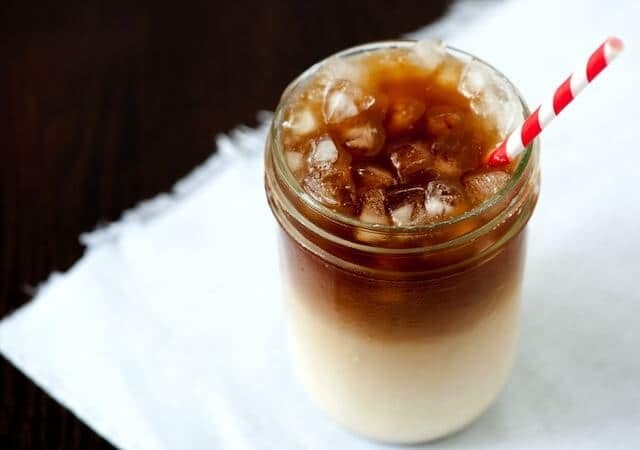 If you have any regional or national recipes for perfect iced coffee, please let us know. We'd love to try it out as well. Our final suggestion for making that perfect glass of iced coffee: Forget the Folgers, or even the Starbucks. Start with a really fine coffee, such as the Triple Certified Organic Shade Grown Fair Trade Peruvian Rainforest Coffee that we sell at The Parrot Cafe. Additionally, use fine water as well, not just regular tap water unless you live somewhere like Seattle, which is blessed with exceptional tap water. Think about it. 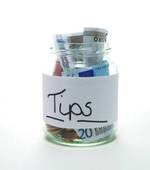 Coffee is ninety percent water, so if you use poor water you'll end up with a poor coffee drink. Use a filter if you can. wow what a cool post , thanks . Somehow we failed to mention the very first method for making iced coffee that we ever learned: freezing fresh brewed coffee in ice cube trays. You can either just let the coffee ice cubes melt in a glass, or add the coffee ice cubes to fresh brewed coffee. This eliminates the problem of diluting fresh brewed coffee with ice. How Does Your Parrot Communicate With You?